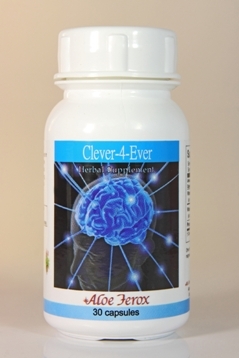 Clever-4-Ever herbal supplements have a beneficial effect on brain function with regard to hyperactivity, brain fog, ageing and Alzheimer’s disease. Phosphatidylserine and vitamins are important nutrients in Clever-4-Ever that help support brain function with regard to memory, learning ability, concentration, linguistic ability and emotions. Aloe Ferox Clever-4-Ever for memory. Aloe Ferox Clever-4-Ever herbal supplements have a beneficial effect on brain function with regard to hyperactivity, brain fog, ageing and Alzheimer’s disease. Phosphatidylserine and vitamins are important nutrients in Clever-4-Ever that help support brain function with regard to memory, learning ability, concentration, linguistic ability and emotions. Directions for using Aloe Ferox Clever-4 Ever to enhance memory function. Initial dose: 2 capsules daily with meals for 3 months. Maintenance dose: 1 capsule daily with breakfast. Active ingredients. 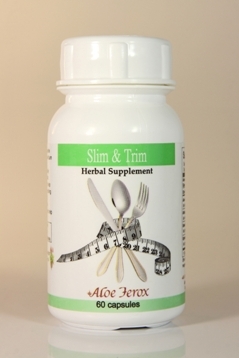 Aloe ferox Bitters, Magnesium Stearate, Calcium D-Pantothenate, Phosphatidylserine, Pyridoxine HCI. Supplement facts. Amount per capsule.Vitamin B6 5mg 250% RDA (as pyridoxine HCI), Vitamin B5 150 mg (as calcium pantothenate), Phosphatidylserine 150 mg. Other: Magnesium sterate, bovine glycerine. Natural Beauty Care suggestions or improved memory function. Maintain a healthy diet to prevent fluctuating blood sugar levels that may cause brain fog and difficulty in concentration. The Aloe Ferox wellbeing range makes use of the considerable properties of the plant Aloe Ferox which contains over 130 medicinal compounds. It is a ‘pharmacy’ in a plant. There are ‘too many to mention’ health issues that Aloe Ferox can help to alleviate, so we’ve listed them by condition. Always seek the advice of your health practitioner. Home.